Gwen said, “My stomach is getting nervous” and that she is really “anxious”. She also said she is really proud and blessed to be on The Voice. Top 8 Revealed! 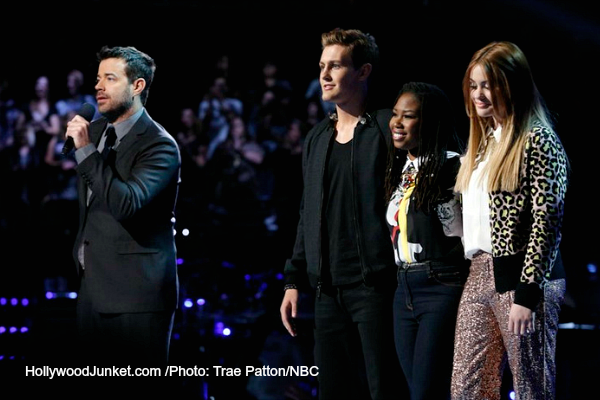 THE VOICE Episode 21 recap. At the start of week two of “The Voice” elimination show, host Carson Daly announced some good news – each Top 10 artist charted on the iTunes Top 200. Like last week’s elimination show, the three artists with the lowest number of votes will be up for the fans Instant Save at the end of the night and the one with the most votes, will stay. “The Voice” adviser this season Taylor Swift performed towards the end of the show. Next, the Top 10 were brought out onto the stage to find out who the fist two artists were to be saved by America’s votes. Host Daly announced that the artist was Craig Wayne Boyd from Team Blake. The next save announced was Matt McAndrew from Team Adam. Carson then asked each coach about their remaining artists left in the game. “I’m super confident that they will get through again” said Adam. Gwen said, “My stomach is getting nervous” and that she is really “anxious”. She also said she is really proud and blessed to be on The Voice. Pharrell said about his artists DaNica and Luke – “I’m pleased at what they’re doing. It’s been amazing to see every week.” He said most of his confidence lies in how they believe in themselves. The remaining artists came onto the stage again. America saved Luke Wade from Team Pharrell. The next artist announced as safe was Taylor John Williams. Pharrell Williams sang “What a Wonderful World” with his artists DaNica Shirey and Luke Wade. Daly then announced who else was saved by America’s votes. It was DaNica Shirey (Team Pharrell). All of Team Pharrell is officially staying in the competition. Chris Jamison from Team Adam is also safe. With Chris, that makes Adam’s team two for three that are safe. THANKSGIVING: The Top 10 families were invited to eat a Thanksgiving dinner with them. They all stated what they are thankful for. The last artist announced to be safe was Damien from Team Adam. That makes Team Adam three for three safe and all are moving on! The contestants in the bottom three were – Anita Antoinette (Team Gwen), Ryan Sill (Team Gwen), Reagan James (Team Blake). They each had to perform a song for America’s Instant Save vote in order to stay on “The Voice”. Reagan James performed “I’m Like a Bird” by Nelly Furtado. Coach Blake said the thing that he loves about Reagan is the fact that she just turned 16 a week ago and she is strong and brave enough to be different – to take songs and put her own spin on it. He told Reagan that she has a friend for life in him. Ryan Sill sang “Collide” by Howie Day. Coach Gwen said Ryan is so talented and then encouraged the audience to scream more for Ryan. She told Ryan that he is an incredible singer and his voice blows her away. The bottom three came out onto the stage to see who would be saved by America’s “Instant Vote” via Twitter in only five minutes time. After the break, the voting percentage was at: Anita Antoinette with 19% votes, Reagan James with 34%, and Ryan Sill with 47% of the votes. Gwen reminded her artists that it’s not about winning, it’s about the journey. Blake told Reagan that she’s doing the right thing with her life and that “this is just the beginning” for her. The artist named as instantly saved was – Ryan Sill, who was also instantly saved last week.